Efficient and effective communication between mobile units and the central emergency operation center is a key factor to respond successfully to the challenges of emergency management. Nowadays, the only ubiquitously available modality is a voice channel through mobile phones or radio transceivers. This makes it often very difficult to convey exact geographic locations and can lead to misconceptions with severe consequences, such as a fire brigade heading to the right street address in the wrong city. 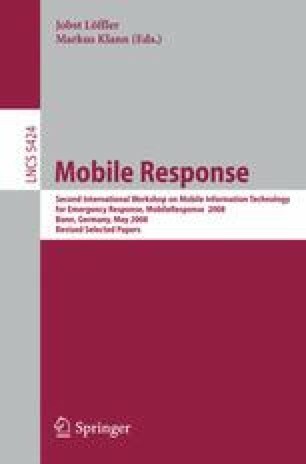 In this paper we describe a handheld augmented reality approach to support the communication of spatial information in a crisis response scenario. The approach combines mobile camera devices with paper maps to ensure a quick and reliable exchange of spatial information.